Want to return your lost love or find your true soul mate? A Master Psychic has blessed these love amulets to help you enjoy the rich life filled with love and happiness. You have nothing to lose. 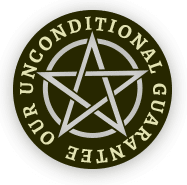 All love amulets from the California Astrology Association are risk free, because if you're not 100% happy with the results we'll refund your money. Period. No questions asked. A Love Sigil Amulet is created when a gifted psychic merges all the letters of a wish into a one-of-a-kind amulet. An I Will Find Love Sigil is created when a gifted psychic merges all the letters of your wish into a one-of-a-kind love amulet. You may also be interested in our Love Spells, Amulets and Talismans for Prosperity and Happiness, Protection Amulets, and our entire collection of Good Luck Charms.